Getting my programs NOT to crash immediately. Making Netbeans play nice, and especially getting timehe debugger to work. I read many tutorials and "how-to" articles, but none was really comprehensive and thorough. Eventually I succeeded in setting up the environment; and after a while of using this (great) library, I decided to write this small tutorial, which will hopefully help others. The environment I use is: Windows 7, OpenCV 2.4.0, Netbeans 7 and MinGW 3.20 (with compiler gcc 4.6.2). Assumptions: You already have MinGW and Netbeans installed on your system. When downloading OpenCV, the archive actually already contains pre-built binaries (compiled libraries and DLL's) in the 'build' folder. At first, I tried using those binaries, assuming somebody had already done the job of compiling for me. That didn't work. Eventually I figured I have to compile the entire library on my own system in order for it to work properly. Luckily, the compilation process is rather easy, thanks to CMake. CMake (stands for Cross-platform Make) is a tool which generates makefiles specific to your compiler and platform. 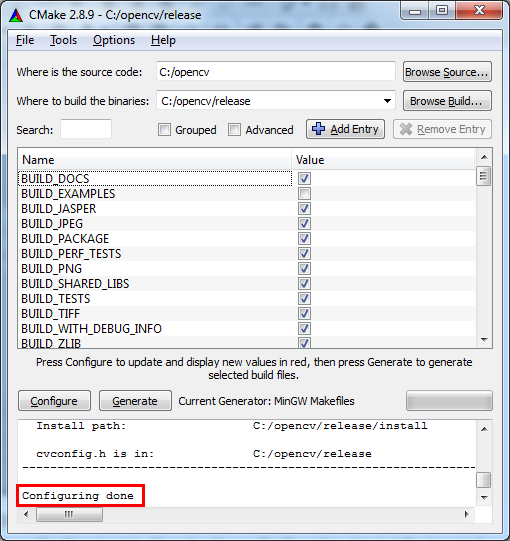 We will use CMake in order to configure our building and compilation settings, generate a 'makefile', and then compile the library. 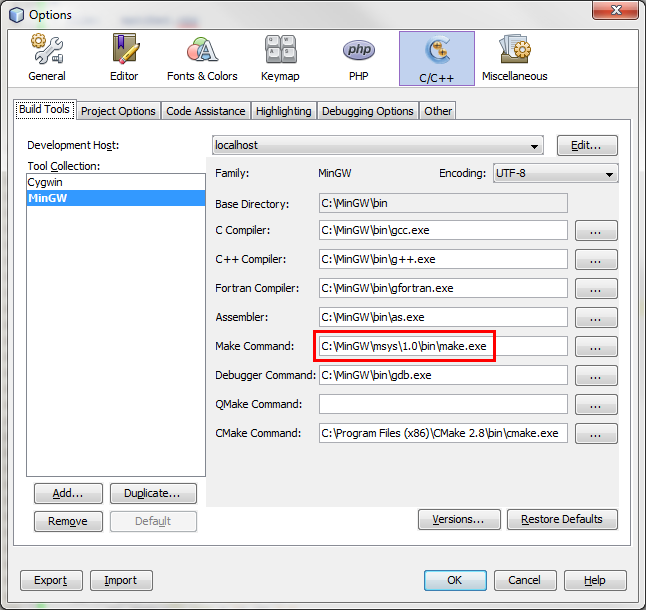 Download CMake and install it (in the installation wizard choose to add CMake to the system PATH). Download the 'release' version of OpenCV. Extract the archive to a directory of your choice. I will be using c:/opencv/. Browse for the source directory c:/opencv/. Choose where to build the binaries. I chose c:/opencv/release. Click 'Configure'. In the screen that opens choose the generator according to your compiler. In our case it's 'MinGW Makefiles'. Change the settings if you want, or leave the defaults. When you're done, press 'Configure' again. 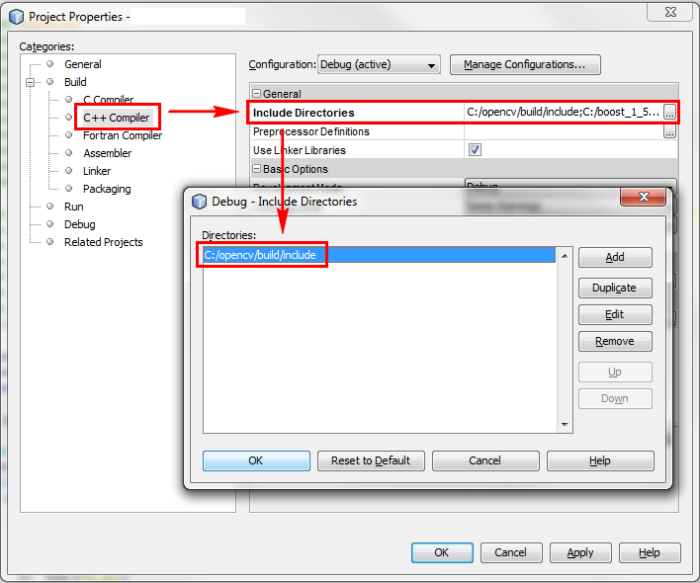 You should see 'Configuration done' at the log window, and the red background should disappear from all the cells. At this point CMake is ready to generate the makefile with which we will compile OpenCV with our compiler. Click 'Generate' and wait for the makefile to be generated. When the process is finished you should see 'Generating done'. From this point we will no longer need CMake. Open MinGW shell (The following steps can also be done from Windows' command prompt). Type mingw32-make and press enter. This should start the compilation process. When the compilation is done OpenCV's binaries are ready to be used. 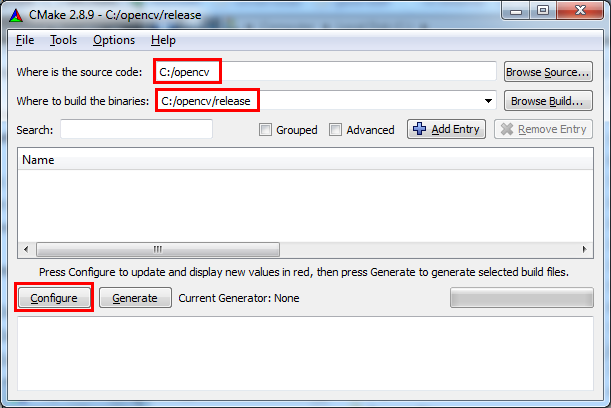 For convenience, we should add the directory C:/opencv/release/bin to the system PATH. This will make sure our programs can find the needed DLL's to run. 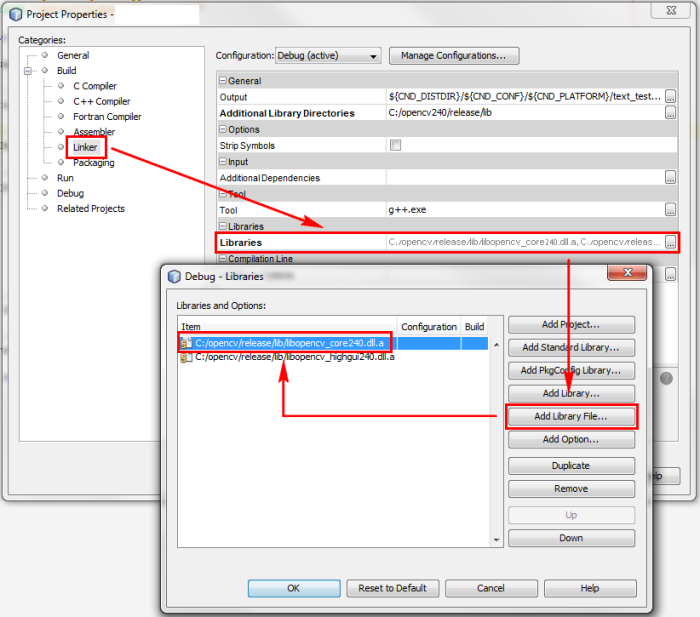 Netbeans should be told where to find the header files and the compiled libraries (which were created in the previous section). The header files are needed for two reasons: for compilation and for code completion. The compiled libraries are needed for the linking stage. Note: In order for debugging to work, the OpenCV DLL's should be available, which is why we added the directory which contains them to the system PATH (previous section, step 5.4). 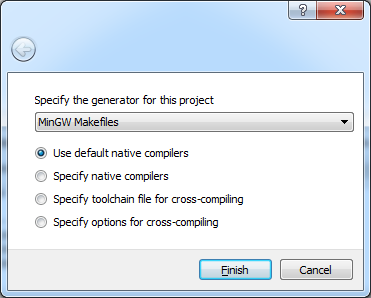 First, you should verify that Netbeans is configured correctly to work with MinGW. Please see the screenshot below and verify your settings are correct (considering paths changes according to your own installation). Also note that the make command should be from msys and not from Cygwin. Add the specific libraries you intend to use. These libraries will be dynamically linked to your program in the linking stage. Usually you will need the core library plus any other libraries according to the specific needs of your program. That's it, you are now ready to use OpenCV! Compile OpenCV with your compiler. 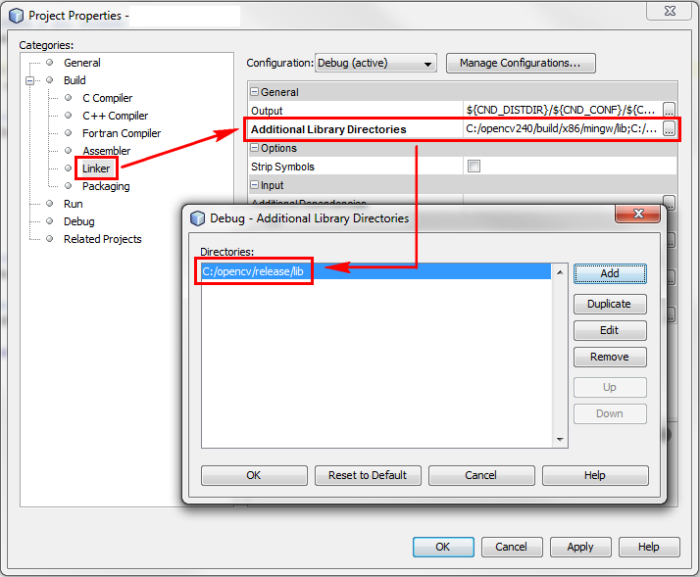 Add the directory which contains the DLL's to your system PATH (in our case: c:/opencv/release/bin). Add the directory which contains the header files to your project's include path (in our case: c:/opencv/build/include). Add the directory which contains the compiled libraries to you project's libraries path (in our case: c:/opencv/release/lib). 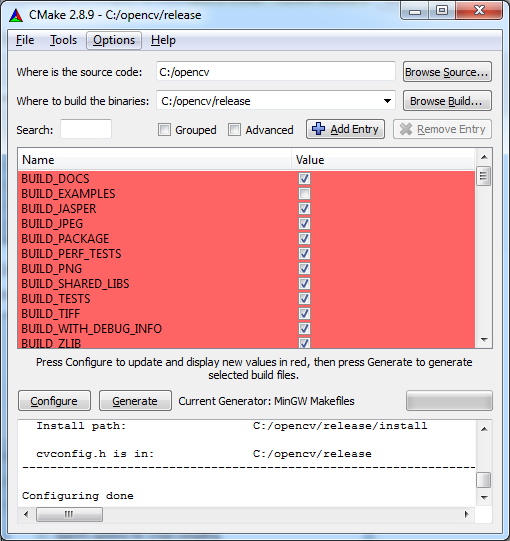 Add the specific libraries you need to be linked with your project (for example: libopencv_core240.dll.a).